I'm blown away because my MIX Open Call session was picked! 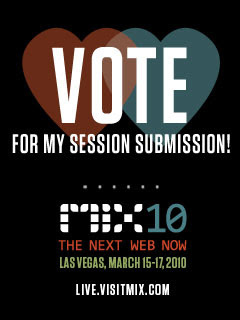 Over 150 sessions were posted for online voting, and mine is one of twelve that made the cut. It's also amazing to see some of the other names that are on that list. There are some really big people there. So in short, thank you all for voting! I'm going to do my best to give a truly awesome presentation and make it worth it. Full Open Call results are here. Update 1/15/2010: Today is the last day for voting, so please visit the site and vote if you have not already. Thanks to everyone who have already voted! I'm totally pumped about NUIs and multi-touch right now. 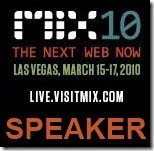 I would love to speak about it at a venue like MIX10, but I need your help! I submitted a session to the MIX10 Open Call for Content. All of the submissions are now online for voting, and you can vote for up to five sessions, even if you are not attending. The top 10 most popular sessions will get a slot at MIX. Title: Developing Natural User Interfaces with Silverlight and WPF 4 Touch. The Natural User Interface (NUI) is the next revolution of human-computer interaction. Microsoft Surface has shown the potential of multi-touch NUIs to uniquely engage users, and multi-touch tablets and displays are becoming more and more common. This session is focused on how you can create multi-touch NUIs for these devices. You will learn the difference between manipulations and gestures, when to use each, and how to implement specific NUI design concepts with both Silverlight and the WPF 4 Touch API. The differences between the Silverlight and WPF 4 Touch APIs will be highlighted. If you are interested in rich, engaging multi-touch interfaces for the web or client, then you need to attend this session! Please go vote for my entry and help spread the word! Voting closes January 15th so don't wait! As a part of the CES 2010 conference, Microsoft released a new video through Channel 9 of a fourty minute interview with Bill Buxton. For those of you who don't know, Bill Buxton is a Principle Researcher at Microsoft Research and has been working with multi-touch interfaces since the 1970's. His combined knowledge, experience, and academic publications make him one of the world's best experts on user experience design, multi-touch and Natural User Interfaces. This interview covered several different topics around Natural User Interfaces and have some really interesting insights. The insights have an eerie timing because some of them are perfect responses to the lengthy discussions going on my in some of my recent blog posts. This is a must-see video if you are serious about NUIs. There is so much here, I watched the interview a second time and took notes so I could reference them in some upcoming writing. Yes, it felt like I was back in college attending a lecture, although I probably didn't take quite as good notes back then. I decided to share my raw notes. Please note that at this point I have not even read through them, so there are probably typos and other errors. I tried to note the key ideas, in Bill's word if possible, paraphrased otherwise. These are provided simply as a guide to this talk. I'd recommend reading the notes and watching the talk at the same time side-by-side. Download the notes then watch the interview below. This control was first released almost ten months ago and since then has had over 45,000 hits and 3700 downloads. It was the first (and only) publicly available control that enables using Bing Maps 3-D in your own WPF and multi-touch Surface applications. There are two big new features I'm really excited about. The first is the addition of a Windows 7 Touch version of the control. The Windows 7 Touch control is at parity with the Surface control, so you can now develop great multi-touch Bing Maps applications in Windows. My colleague, Joe Milenky, made significant contributions towards getting the Windows 7 Touch control up and running. This version only requires .NET 3.5 SP1. The second big thing is an overhauled set of map movement algorithms and a few new manipulations. The new code allows manipulation-centered panning and zooming, plus we have added Pivot (rotate two or more fingers to spin around that point) and Tilt (pitch). There is a MapManipulationMode property that you can toggle to change between Panning and Tilting, very similar to how Surface Globe from the Windows 7 Touch Pack works. In fact, with InfoStrat.VE R2, you could make your own Surface Globe and not be able to tell the difference! There's also much more than that, but those are the two most visible things. The other changes include Bing Maps 3-D version 4 support, plus 12 different feature requests or bugs submitted by the InfoStrat.VE community on the CodePlex discussion forums. And how much would you pay for this? $500? $1000? No, it's free, and even better, open source! Head over to the CodePlex site and download the new binaries and source code right now! There are more details on the new features in the discussion thread announcing this release.